You’ve got your CCW handgun, but before you start packing here are five things about concealed carry holsters you need to be aware of before you go armed. D.M. Bullard’s exotic holster is a beauty, but also note the reinforced belt loops and double stitching. It is made to last and withstand the many repetitions needed to achieve real speedand smoothness in practice. Some effort is required to find the right concealed carry holster, but no matter what the choice, there is always an acclimation period. Some handguns are more ergonomic than others, but few are completely devoid of sharp edges. A quality concealed carry holster goes a long way toward making carrying a defensive handgun bearable. There are many choices, and some are readily available. Blackhawk, DeSantis, and Galco are among the best-known and most reliable mass-produced holsters. 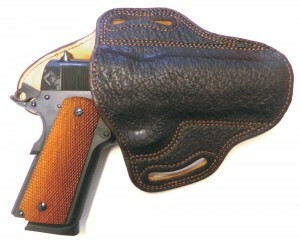 There are fine concealed carry holsters that are custom made and that might be said to be examples of the maker’s art. These are not inexpensive and often take weeks, if not months, to obtain. Still, while the concepts of inexpensive and high quality don’t always go together, there are good holsters offering a balance of value and cost. There are tradeoffs inherent in Kydex, but there are also advantages. One of the biggest pluses is that the material is maintenance-free and impervious to solvents or moisture. A tradeoff, if it can be called one, is that a leather holster maintains security on the long bearing surfaces of the pistol, while the Kydex holster keeps its grip primarily on the muzzle and trigger guard area. Of the downsides? 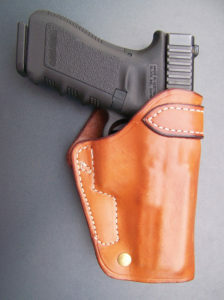 Some say Kydex will wear the finish off a pistol quickly, but so does properly fitted leather. The Ted Blocker crossdraw has earned the “classic” title, because it continues to work well with modern handguns. With practice, it is versatile and fast into action. My choice in defensive handguns is based on many years of practical experience. Having been in the wrong place at the wrong time more than once, and having written quite a few reports concerning shootings and other mayhem, I am aware of the relative wound potential of different handguns. I prefer the .45 ACP and the .357 Magnum. The .38 Special and 9mm+P are also realistic minimum calibers. I’ll always lean towards one that is manageable and accurate. Concealing a serious defensive handgun under lightweight garments can be problematic. If the handgun is short and compact, an outside-the-waistband (OWB) holster under a sport shirt will work fine, but, for most of us, the inside-the-waistband holster (IWB) is superior. Your covering garment is important. I have adopted a Kakadu sport shirt for much of my concealment needs. This shirt is made of Gravel canvas and has a leather collar. I admit it is stylish, but it also conceals a holster well without printing the outline of it for the world to see. This article on concealed carry holsters is excerpted from Gun Digest 2014, the world’s foremost annual book about firearms. Take a look at Gun Digest 2014 by clicking here.